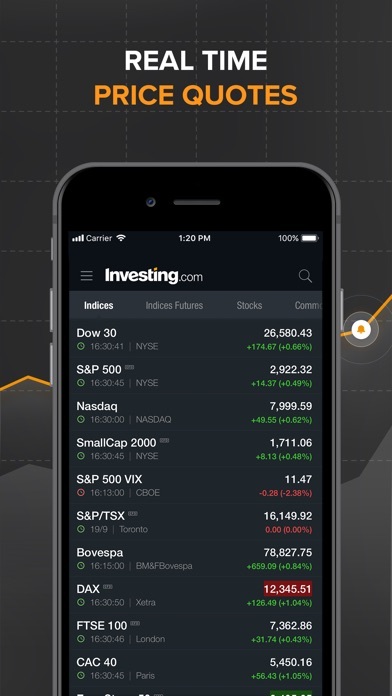 Investing.com offers a set of financial tools covering a wide variety of global and local financial instruments. A one-stop-shop for traders and investors. 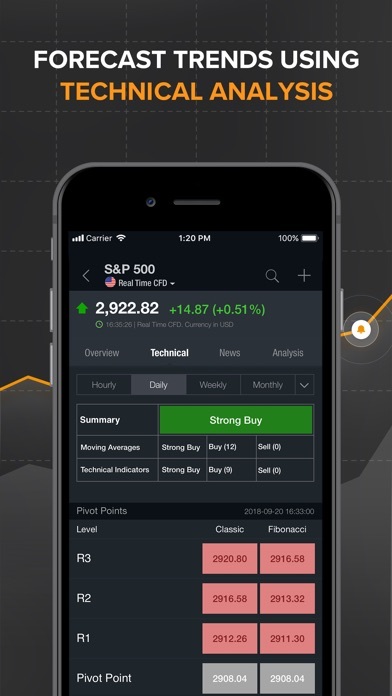 REAL TIME DATA Live quotes and charts for over 100,000 financial instruments, traded on over 70 global exchanges. Track major global indices, stocks, bonds, commodities, Forex, interest rates, futures and options. ECONOMIC CALENDAR Live updates on global economic events customized to your personal interests. 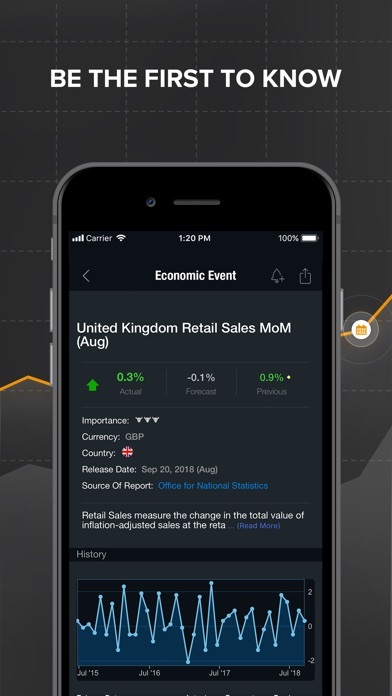 Our real time Economic Calendar is used by top traders and investors to track market-moving events as they are announced, making it easy to track market impact. 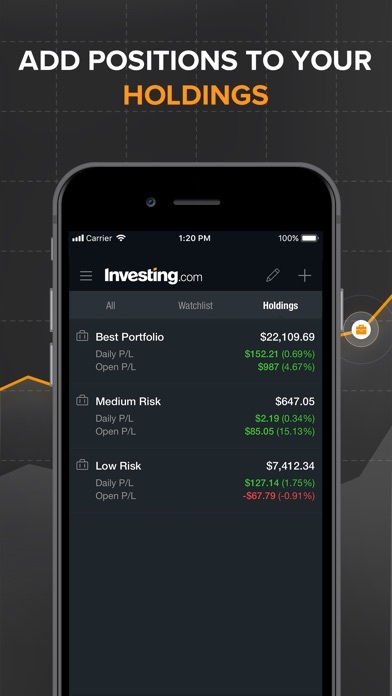 PERSONALIZED PORTFOLIO Add your favorite financial instruments and their holdings to your portfolio. 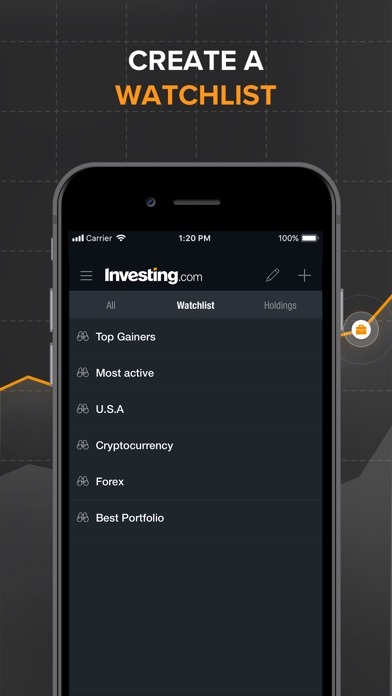 Build your own customized watchlist and keep track of stock quotes, currencies, commodities, indices, ETFs and bonds - all synced with your Investing.com account. Your personal Watchlist can be accessed anytime from your menu, providing you with real-time prices, and the Holdings Portfolio shows you your total assets value 24/7. ALERTS Our Alerts system allows you to receive customizable alerts for any instrument, economic event or new analysis articles. For all 100,000 financial instruments, you can set up notifications for a specific price, change by %, or Volume. All pushed by request, and synced with the website. NEWS & ANALYSIS Breaking news, videos, updates and analysis on global financial markets, as well as technology, politics and business. 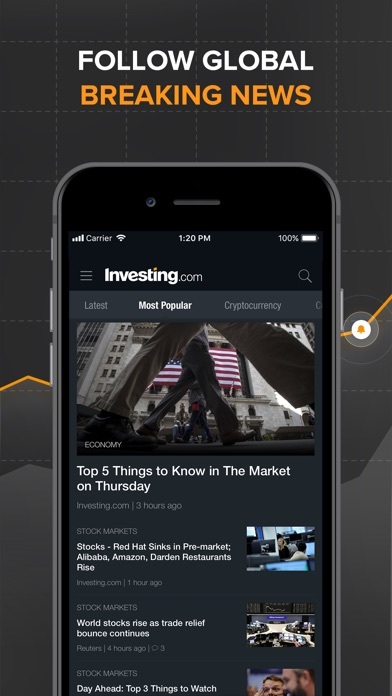 Be the first to read the latest on stocks, Forex, commodities, and global economy. 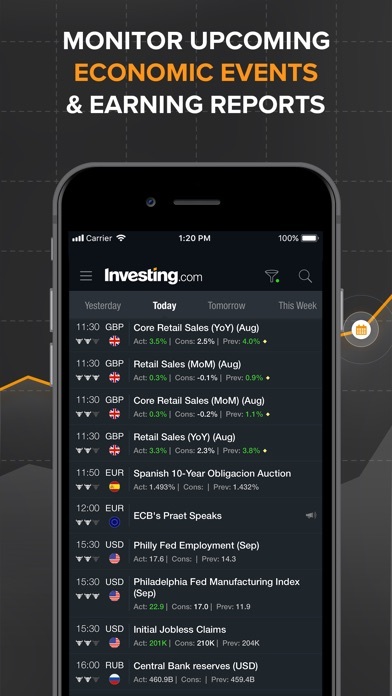 FINANCIAL TOOLS Quick access to all of our world-class tools, including: Economic Calendar, Earnings Calendar, Technical Summary, Currency Converter, Market Quotes, advanced charts and more. ALREADY A MEMBER? 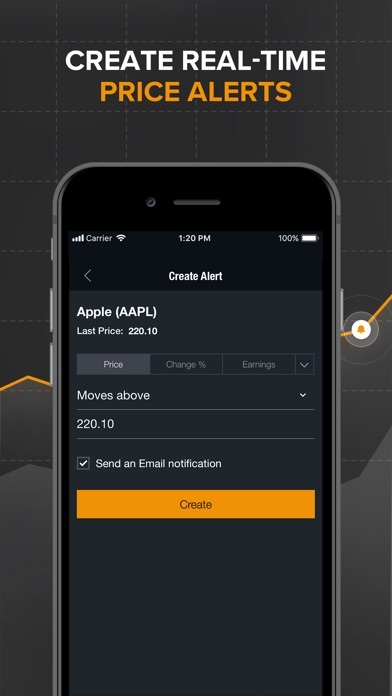 Sign-in and continue where you left off by syncing your portfolio and personal alerts between all of your devices. SOCIAL Join our growing community of traders and investors and share articles to Facebook, WhatsApp, Twitter, and LinkedIn. OUR DATA: COMMODITY PRICES Follow up-to-the-second commodity prices, including: Gold, Silver, Copper, Platinum, Crude Oil, Brent Oil and Natural Gas. FOREX RATES Track forex rates for major currencies: EUR/USD, GBP/USD, EUR/CHF, AUD/USD, USD/JPY, USD/CAD, USD/CHF, BTC/USD, USD/RUB, USD/HKD, etc. CRYPTOCURRENCY: Altcoin market news, prices, caps and volume changes for the likes of Bitcoin (BTC), Ethereum (ETH), Ripple (XRP), Bitcoin Cash (BCH), Cardano (ADA), NEM (XEM), Litecoin (LTC), Stellar (XLM), IOTA (MIOTA) ,TRON (TRX), Dash ,NEO,Monero (XMR), EOS, Qtum, Bitcoin Gold (BTG), ICON (ICX), Lisk (LSK), Ethereum Classic (ETC), RaiBlocks (XRB), Verge (XVG) and Populous (PPT). All Cryptocurrencies are also available under your Portfolio and as Price alerts. MAJOR STOCKS Track stock market leaders: Apple Inc. (AAPL), Alphabet Inc. (GOOGL), Bank of America Corporation (BAC), Tesla (TSLA), General Electric Company (GE), Cisco Systems, Inc. (CSCO), American Express Company (AXP), Amazon (AMZN), Nike (NKE), Microsoft Corporation (MSFT), Netflix (NFLX), and many more. GLOBAL INDICES Follow data from all major stock market indices, including: ■ U.S: Dow Jones, S&P 500, NYSE, NASDAQ, SmallCap 2000 ■ Americas: Merval, Bovespa, RUSSELL 2000, IPC, IPSA ■ Europe: CAC 40, FTSE MIB, IBEX 35, ATX, BEL 20, DAX, BSE Sofia, PX ■ Asia-Pacific: CNX Nifty, Shanghai Stock Exchange Composite Index (SSEC), Hang Seng, KOSPI - and many more. ■ Africa: BSE Domestic Company, Kenya NSE 20, Semdex, Moroccan All Shares, South Africa 40 ■ Middle East: Bahrain All Share, EGX 30, Amman SE General, Kuwait Main, TA 35 RATES BONDS Real time data on bonds, including US Yield Bonds, Euro Bund, UK Gilt, Euro BTP and more. Where’s the Candlestick Pattern Feature?! Careful what you post, if it’s bullish and they are leaning bearish and your comment is informative and precise they will delete it. Same applies with bearish posts, it depends on the moderators view. I’ve never posted anything that would violate any terms. However, moderators have deleted my comments. Also many many news articles are very bias as well. Basically agin leaning towards what they feel. Will I recommend it, nope. My coworkers and other trading partners all agree and have been shocked to see my comments deleted. So for that, I will be deleting this app. Go download TOS and set up an account. At least the traders there are educated and don’t post ridiculous worthless information. 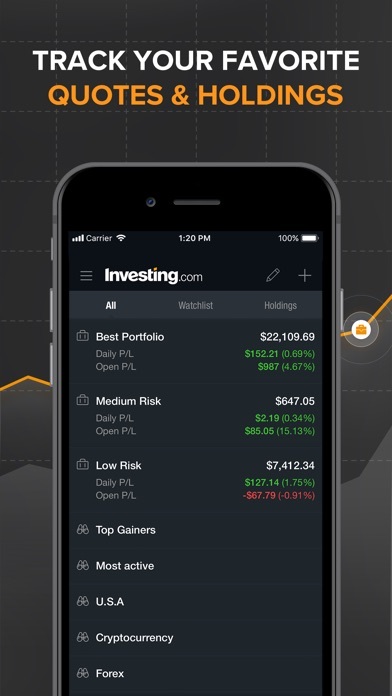 This app/website is my go to for EVERYTHING FOREX AND STOCKS. So glad I found and started digging!